The current social media star can be found at 145 Rue La Fayette, within shouting distance of the Gare du Nord. At first sight it seems almost identical to its neighbours. It has six stories, twin pairs of windows, balconies and even neo-classical stylings. It is at ground floor level though that things become a little more dubious. The supposed entrance door has no digicode or handle, and there is even a garage doorway which is blocked by a pair of telephone boxes. Contrary to what has been written elsewhere (even by the author Umberto Eco, more of which in a moment), these doors have not been painted to look like wood. In fact, a thin layer of chipboard has been pasted onto the metal, but nevertheless, nobody ever opens them. Look back upwards, in through the dirty or broken windows, and you can see that the building is in fact hollow. It is simply an empty shell, a giant air-vent stemming upwards from the city's RER transport system that runs below. The creation of this shell dates back to the beginning of the 1980s when the RER B was extended up from the south of Paris to join lines running north from the Gare du Nord. The construction of the tunnel required a surface air vent, and developers picked out this particular location as the perfect spot. Exact details about how they went about this are sketchy, but it seems that the building was one that was already owned by the SNCF. As they put the air vent in place, they decided that it would be simpler to keep the original façade. So why have people just woken up to this story now? Umberto Eco wrote about it in his book ‘Foucault's Pendulum’, describing the building as the mouth of hell, or a portal to a mysterious Paris underworld, but that was back in 1988. Perhaps it is down to the current state of the building. Whereas it had always effortlessly blended in to its surroundings, the disguise – the fake nose and glasses – is now slipping off its face. The rather filthy walls and windows are a clear indication that the building is empty. The idea that our cities might be dotted with fake buildings is clearly one that attracts, perhaps even more so in Paris than elsewhere. 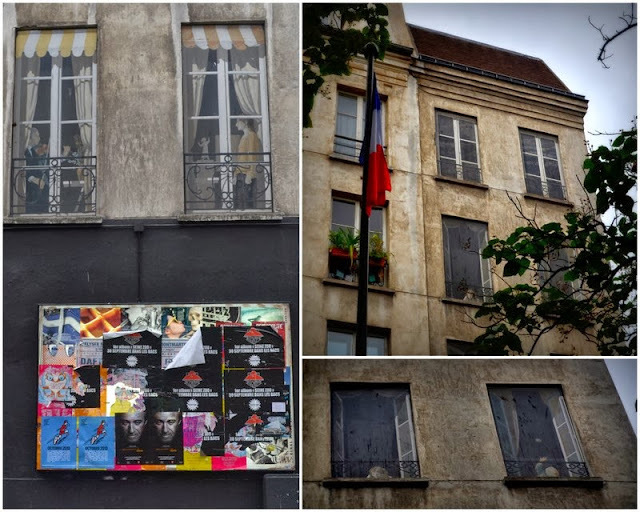 The Haussmannian buildings stand rigid and superficially identical, and all with a distinct purpose – as homes to the bourgeois or office space to professionals. The thought that perhaps this is largely some kind Stepford Wives façade, and that behind those solid and inaccessible walls there may be something more sinister tickles our imaginations. Two other buildings in the city give even more food for thought. To find another similar building you don’t need to go far. 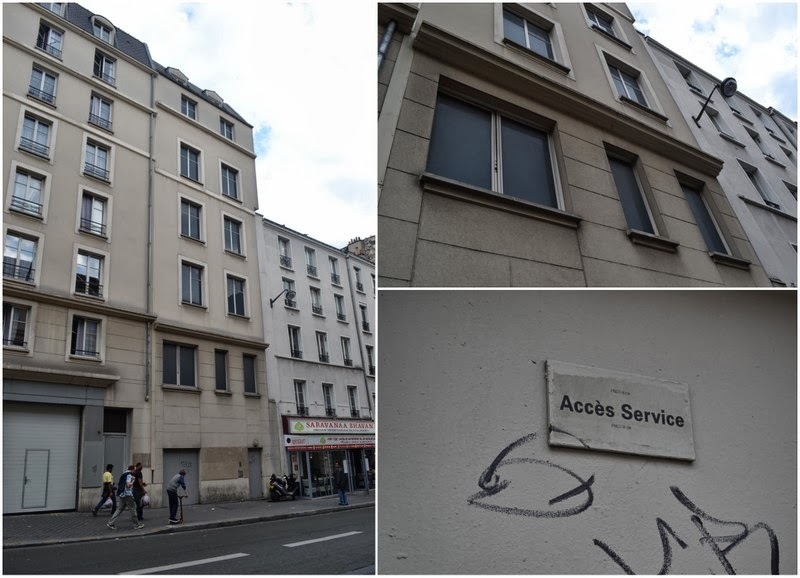 Walk a few metres to the north, onto the Rue du Faubourg-Saint-Denis, and you will find another air vent disguised as an appartment block. 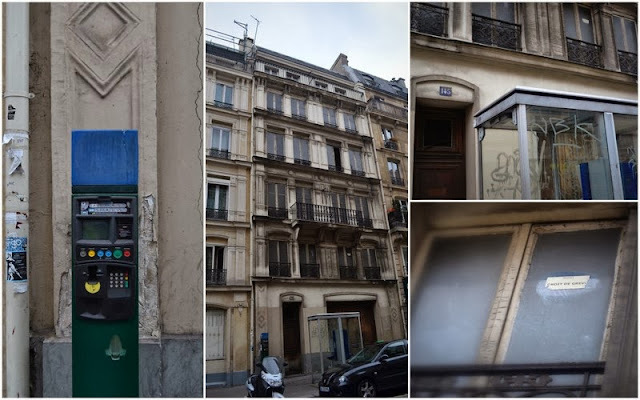 The difference here though is that the vent was drawn into the design of the building, a structure that went up at the same time as the construction of the city’s RER E line (at the end of the 1990s). In this case, the vent is disguised behind an extension of a real building. People live alongside this chimney, in apartments that look identical (although somewhat bizarrely the ‘fake’ building has one less floor). Vaguely Haussmannian in size and form, it is nevertheless clearly more modern, and therefore perhaps of less interest to the city’s explorers. The ground-floor level looks unwelcoming and unfamiliar too. It doesn’t look residential, with a strange sign on one door stating simply ‘Accès service’ and menacing blacked-out windows above. For those passing by there is clearly something out of the ordinary here, so the idea that the doorway in fact passes through to a hole in the ground is perhaps less of a surprise than at the Rue La Fayette. The third ‘fake’ building – and real air vent - brings us into the heart of Paris, alongside the Centre Pompidou. Once again there is a connection to the city’s RER transport system, three lines of which criss-cross the city nearby. If this particular building has been overlooked it is perhaps down to the fact that it sits in an area of architectural oddities and open spaces. After all, what could be stranger than the multi-coloured tubes of the Centre Pompidou? Indeed, given the experimental structures in the area, this particular ‘fake’ building can perhaps be seen more as an opportunity missed. The whole Beaubourg area was redeveloped in the 1970s, but it is not clear when this particular chimney was put in place. I’m not even sure whether the walls are the original skeleton of a gutted building (a Hotel Calvados was listed at this spot at least up until the 1930s), or if it was rebuilt afterwards to look identical. What is clear though is that everything has been done here to make it blend into its background. It looks ancient, but is in fact a trompe l’oeil. Rather than desirable housing it is in fact a painted chimney, with a number of somewhat kitsch and almost creepy scenes playing out behind the fake windows. At ground floor level, nothing is happening. In place of doors or a shopfront there is just a black wall and an advertising board. Wrapped round its interior flanks though is a footwear shop, the customers seemingly unaware that behind the wall of merchandise there is a giant hole in the ground. The three buildings seen from above. 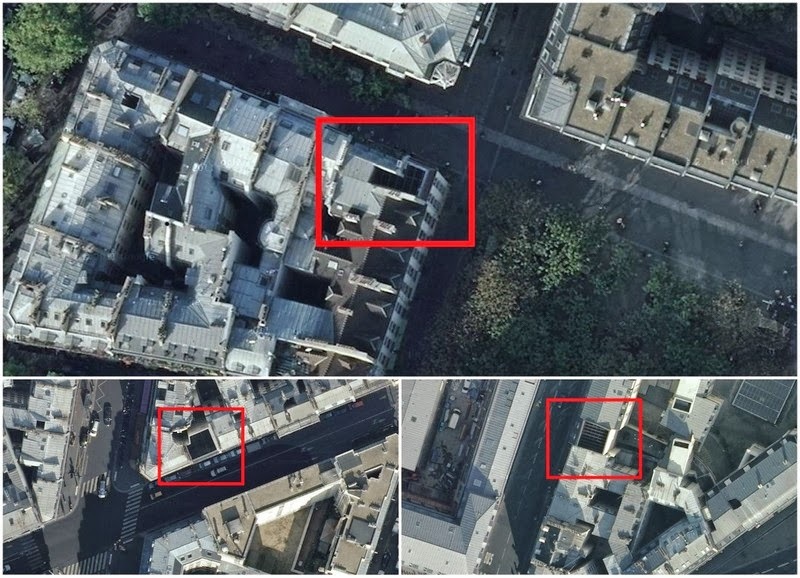 29 Rue Quincampoix on top, 145 Rue La Fayette bottom left, and 174 Rue du Faubourg-Saint-Denis bottom right. Very interesting article. Too bad the authorities didn't use the same idea to enclose the Montparnasse Tower! Now that would be a giant chimney! Some years ago, I saw a similar article in a blog about London, where they also have "imaginary homes" for providing air to the underground. Very interesting. Cynbook: You must be referring to 23-24 Leinster Gardens.